Download the cDataSet.xlm file from here (folder Data Manipulation). This example loops through every row in the dataSet and prints the cell in the ‘Total’ Column of each row. By design, all manipulation is on the contents of the cDataSet, not on the underlying worksheet. This means that processing is many times faster than you are used to, and it also means that you do not need to commit the changes until everything is finished. This makes rollback very simple if something goes wrong. You just don’t commit it and the worksheet stays intact. This example calculates a total column and commits the changes to that column only. You can commit the entire DataSet with dSet.Commit, but since we are only updating one column there is no point. Parameter sheets are a useful way of providing variable data to your procedures. A parameter cDataSet gives you an very quick an easy way to devise a parameter methodology and syntax. For an example of a parameter sheet, look here. Parameters are given as a table with rows where the first column is the parameter name, and columns containing the values associated with that parameter name. For example, a parameter called Plots.Chart.Width would be on the table called plots, at the intersection of row charts and column width. cDataSets allows multiple tables on the same worksheet, identified by a unique table name, and also allows you to access a particular cell through it’s name. So the value of the example parameter above would be dSets.DataSet(“plots”).Cell(“chart”,”width”).Value. This example creates a dataset (from worksheet “summary”) and two parameter sets (from worksheet “parameters”. You can also copy the data to a place other than the original location specified in the .Where property. For example, dSet.bigCommit Range(“Contact!$a$1”) will copy an entire dataset to some location starting at the given range. 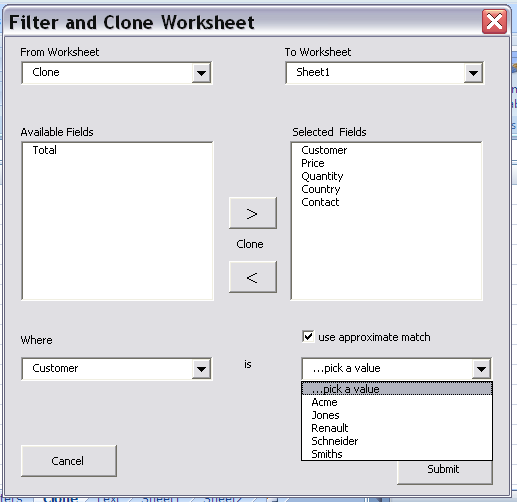 In the example above, you can see that the filter Value combox has been populated with every value found in the Customer Column. This is easily achieved through the cDataColumn(“Customer”).uniqueValues property. It is possible to return a cJobJect from a cDataSet. This is a arbitrary object that can be used to represent data of a hierarchical, or structured format. You can think of it as a ‘class on demand’. The main purpose of this class on this site is to convert to and from jSon in order to communicate with web applications. cDataSet is also capable of populating from a cJobject. This means that we have a very simple way to get Excel data in and out of other web application such as Google Visualizations.